Our GuaranteesWe guarantee your satisfaction and the uptime of your websites. HostNexus is founded on quality, reliability and affordability. 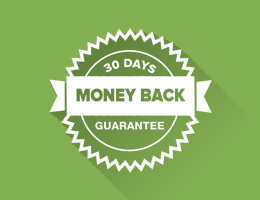 We honor our services to the fullest, therefore we offer a 30 day money back guarantee. If for any reason you are not completely satisfied with our services, you may cancel your account within the first 30 days of service and receive a full refund. Our uptime guarantee is provided via service level credits. If we don't meet our uptime targets you are eligible for a credit towards your account and applied to future invoices. If you believe you qualify for an uptime guarantee service credit please contact our billing department. After validation with our own monitor a credit will be applied to future invoices. Cash refunds are not issued as a result of downtime. This uptime guarantee does not include downtime that is out of our control. This includes such things as upstream network outages, Internet backbone congestion and power failures. Delinquent accounts (accounts behind on billing) do not qualify for service level credits. On shared servers uptime is governed by overall web server uptime as calculated by our monitor. Individuals site outages also do not qualify for service credit as site downtime can be caused by many factors such as resource overuse. On VPS and Dedicated Server plans uptime is calculated based on overall device uptime. For more detals on our SLA please visit this page.